This kabob is like summer on a stick, with chunks of beef steak, zucchini and yellow squash basted with a zesty pesto sauce. Soak eight 12-inch wooden skewers in water 30 min. Meanwhile, mix steak sauce, pesto and lemon juice until well blended; set aside. Preheat grill to medium heat. Thread steak and vegetables alternately onto skewers. Remove 1/4 cup of the steak sauce mixture; brush evenly onto kabobs. Grill 8 to 10 min. or until steak is cooked through and vegetables are crisp-tender, turning and brushing frequently with the remaining steak sauce mixture. Substitute pearl onions for the red onion wedges. Blanch 24 pearl onions in boiling water 1 min. ; rinse, then peel. Assemble kabobs as directed adding 3 whole onions to each skewer. 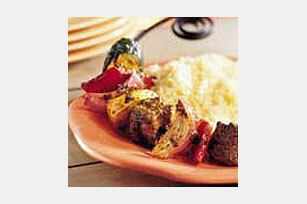 These kabobs are also delicious broiled! Assemble kabobs as directed. Place on rack of broiler pan. Broil, 4 to 6 inches from heat, 8 to 10 min. or until steak is cooked through and vegetables are crisp-tender, turning and brushing occasionally with the remaining steak sauce mixture.